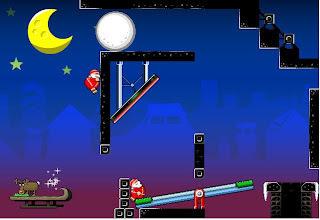 Super Santa Duder Shooter is another holiday themed physics based point and click game from shockwave. Help santa make it down 36 chimneys to make Christmas happen by giving him the right reindeer power kick. The game is controlled entirely by mouse - aim and adjust the power of the kick before kicking him by clicking. This one is equally entertaining like ragdoll cannon series only it is xmas themed. There are also other objects in some levels such as seesaws, crates and trampolines that you can use to your advantage. Anyway, if you need some tips, hints, solutions or the complete (SSDS) Super Santa Duder Shooter walkthrough just continue scrolling down.